‘The past is a foreign country: they do things differently there.’ Arguably one of the most quoted and well known opening lines of any novel; I would at least put it up there with the opening to Pride and Prejudice and Rebecca. I’m not sure where I first heard this infamous line, but I know that this novel has been on my reading list ever since…and I am pleased to say I finally got round to reading it. 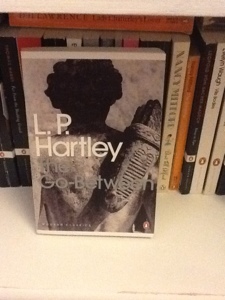 L.P. Hartley’s The Go-Between, set in the long, hot summer of 1900, is essentially the reflection of on old man looking back at a mysterious and shocking event that occurred on the cusp of his movement into adulthood and had a dramatic impact on his life thereafter. Leo is visiting a school friend at the imposing Brandham Hall when he is called upon by his friends older sister to deliver letters to a local farmer. Leo, naively believes these letters are of a business nature, but when he discovers the reality he is plagued by guilt and forever looking for a way out of his role as Mercury, the messenger boy, unaware that the ending will come sooner than he thinks and will hold traumatic repercussions for all involved. The novel is told from the first person perspective of Leo, and this allows the reader a fascinating insight into his mind and how he interprets the events at hand. His innocence, and the trust placed in him, is somewhat hard to imagine in the modern day; he genuinely has no idea as to the true relationship between Marian and Ted, the farmer. This leads to a great sense of dramatic irony throughout the novel as we, the reader, are fully aware as to what is happening right in front of Leo’s eyes, and the tension built up throughout (will Leo figure it out? Will the family find out?) is what kept this novel going for me, especially as I have been crazily busy and had little time for reading over the past week. Yes it is true that this can be seen as an elderly woman’s last chance to push the blame and responsibility elsewhere, but who can blame her? She was young and in love at the turn of a new century, a century that promised a fresh start and peace and unity across the British Empire, thus a more fulfilling and happier life for all, instead she was met with forbidden love, death, devastation, abandonment and decay. I’m not saying that the impact her selfish actions had on Leo’s life and the loves of her loves ones are to be forgiven, it’s just that Hartley so convincingly persuaded me to pity her at the end.